Background: Locally advanced and unresectable oral cavity cancers have a poor prognosis. Induction might be beneficial in this setting by reducing tumor bulk and allowing definitive surgery. Aim: To analyze the impact of induction chemotherapy on locally advanced, technically unresectable oral cavity cancers. Materials and Methods: Retrospective analysis of patients with locally advanced oral cavity cancers, who were treated with neoadjuvant chemotherapy (NACT) during the period between June 2009 and December 2010. Data from a prospectively filled database were analyzed for information on patient characteristics, chemotherapy received, toxicity, response rates, local treatment offered, patterns of failure, and overall survival. The statistical analysis was performed with SPSS version 16. Results: 123 patients, with a median age of 42 years were analyzed. Buccal mucosa was the most common subsite (68.30%). Three drug regimen was utilized in 26 patients (21.10%) and the rest received two drug regimen. Resectability was achieved in 17 patients treated with 3 drug regimen (68.00%) and 36 patients receiving 2 drug regimen. Febrile neutropenia was seen in 3 patients (3.09%) receiving 2 drug regimen and in 9 patients (34.62%) receiving 3 drug regimen. The estimated median OS was not reached in patients who had clinical response and underwent surgery as opposed to 8 months in patients treated with non-surgical modality post NACT (P = 0.0001). Conclusion: Induction chemotherapy was effective in converting technically unresectable oral cavity cancers to operable disease in approximately 40% of patients and was associated with significantly improved overall survival in comparison to nonsurgical treatment. Introduction: In developing countries, a high proportion of patients with oral cancer are from lower socioeconomic classes. This high proportion is clearly associated with difficulties in accessing the health care system. 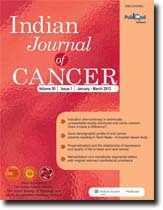 Hence, the aim of this study is to assess the socio-demographic profile of oral cancer patients at Tamil Nadu, India. Objective: To determine the socio-demographic profile of study subjects. Materials and Methods: This study was a cross sectional study done at a cancer hospital in Chennai. The study population were subjects with oral cancer who reported for treatment. A pretested interviewer administered questionnaire was used to assess the socioeconomic status of oral cancer patients. Pareek's scale of classification was used for rural population and Kuppuswamy's classification was used in urban population to assess the socioeconomic status. 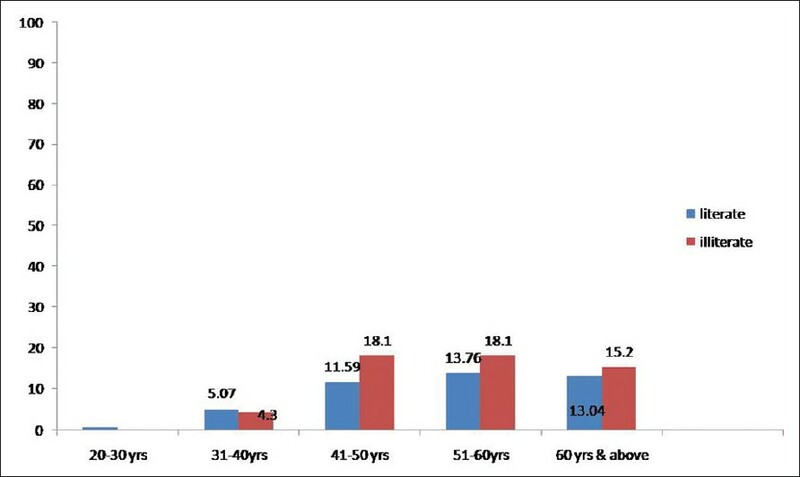 Results: A total of 266 oral cancer patients aged 21-60 years and above comprised the study population. Most of the study subjects belonged to the lower socio economic classes. About 48.5% of rural subjects had agriculture as a source of occupation and 28.6% of urban subjects were unskilled labourers. In both rural and urban subjects, majority, 94.9% and 71.9% had family income below Rs 5000. The percentage of illiterates was high in both rural and urban class (i.e.) 55.8% and 21.9% respectively. The difference in the prevalence of oral cancer among different levels of literacy and occupation was found to be significant statistically. Conclusion: Identifying occupation, income and education specific disparities in tobacco use can provide a useful "signspot" indicating inequalities that need to be addressed by policy makers and broader community through allocation of resources. Background and Purpose: To evaluate the relationship of emotional status and health-related quality of life (HRQOL) in disease-free head and neck cancer (HNC) patients post treatment and to explore their predictive factors. Materials and Methods: Seventy-three HNC patients, post treatment at least 1 year, were recruited to complete three questionnaires, EORTC QLQ-C30, EORTC-H&N35 cancer module, and the Beck Depression Inventory-II (BDI-II). Results: Patients with depression demonstrated significantly poor global health status/QoL (score 41.7 vs. 71.9, P<0.001) and almost all functioning, except for role functioning. Besides, depressive patients presented statistically significant worse symptoms in all QLQ-C30 items, except constipation and financial problems, and in all QLQ-H&N35 symptoms except for teeth and coughing problems. Depression was significantly negative correlated with all functional scales and global health status/QoL (r = -0.341 to -0.750, all P<0.05), and was significantly positive correlated with symptom scales (r = 0.348 to 0.793, all P<0.05), except for constipation. Stepwise multiple linear regression analyses showed that physical functioning and physical distressful symptoms play an important role in the perception of HRQOL (total 46% explained). Global health status and impaired social functioning could explain depression in addition to emotional functioning (total 64% explained). Conclusions: HNC patients with depression were noted to have poorer HRQOL in almost every functioning symptom. HNC patients may get benefit from early interventions to improve HRQOL, emotional status, or both by a more rapid and friendly questionnaire to earlier identify patients with poor HRQOL or depressive status. Resection or loss of a portion of the mandible can result in a variety of functional, cosmetic and psychological deficits that are dependent on the extent of the defect, the concomitant therapy and the timing of rehabilitative efforts. These impairments greatly affect the patient's Quality of life (QOL). The thrust in cancer care is not simply on survival but on rehabilitation, which aims to improve multiple impairments and QOL. This article describes a case of a 58-year-old female with segmental resection of the anterior mandible, extending to lower lip, resulting in a large intraoral as well extra oral defect. Prosthodontics rehabilitation was done using a two-piece intra oral and extra oral prosthesis oriented to each other using magnets. Use of magnets for retaining the extra oral prosthesis simplifies the clinical and laboratory phase enhancing patient's comfort and psychological morale. Objective: The aim of this retrospective study was to find out the role of neo-adjuvant chemotherapy (NACT) in changing the management and outcome of advanced hypopharyngeal cancer patients. Materials and Methods: This is a retrospective analysis of 59 treatment naïve, advanced hypopharyngeal cancer patients presenting to our tertiary care center from April 2010 to October 2011. NACT was given as two (platinum with taxane) or three drug with (platinum, taxane with 5-flurouracil [5 FU]) as 3 weekly regimen with cisplatin and docetaxel as 75 mg/m 2 each, 5-FU as 1000 mg/m 2 . NACT was either given with the intent of achieving: (1) surgical resection (extensive soft tissue disease, oropharyngeal involvement, extensive disease with cartilage erosion) or (2) organ preservation (Bulky disease with inner cartilage erosion, exolaryngeal disease without cartilage erosion, large N3 nodes). Results: The mean age of this population was 55 years. Most (83%) of the patients had pyriform sinus (PFS) involvement. 69% patients had Stage IVa disease, 21% Stage IVb and 10% Stage III. The overall response rate was 66%, including 06% complete responses and 60% partial responses. Following NACT, resectability was achieved in 30% (10/33) and organ preservation protocol was planned after NACT in 73% (19/26) patients. The main toxicities were neutropenia (grade 3, 4, 04%; febrile neutropenia, 4%), mucositis 5%, diarrhea 5%. The median progression free survival was 20 months. Conclusions: NACT can be useful in patients with oropharyngeal involvement to achieve surgical resection and larynx preservation in patients with bulky T3 disease. The availability of imatinib followed by other tyrosine kinase inhibitors (TKIs) has dramatically altered the outcome of gastrointestinal stromal tumor (GIST). Patients with advanced or poor risk disease can now expect survival measured in years instead of months. An experienced multi disciplinary team (MDT) will be able to personalize therapy to ensure maximum benefit. This review will provide the updated information and finer points regarding state of the art management of GIST with the use of imatinib and other TKIs. Background: Extra gastrointestinal stromal tumors (EGIST) are uncommon compared to their gastrointestinal counterparts. EGISTs involve omentum, mesentery, retroperitoneum, pancreas, and pelvis. Materials and Methods: Ten EGISTs were analyzed in this study from January 1995 to November 2011. They were analyzed with respect to clinical features, imageological, histopathological, and immunohistochemical findings. The immunohistochemical stains used were Smooth muscle actin (SMA), Desmin, S-100 protein, CD34 and CD-117. Results: There was slight female preponderance with wide age range. Four of the tumors were in retroperitoneum, three in mesentery, and two in omentum and one in pelvis. Histopathologically majority were spindle cell tumors. Immunohistochemically CD117 was consistently positive followed by CD34. Smooth muscle actin was positive in eight cases, S-100 protein and desmin were positive in two cases each. 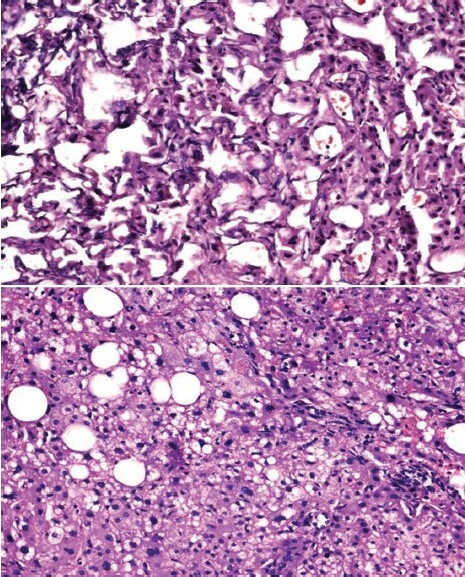 Conclusion: EGISTs are rare and should be considered in the differential diagnosis of the mesenchymal tumors and immunohistochemistry helps to confirm the diagnosis. 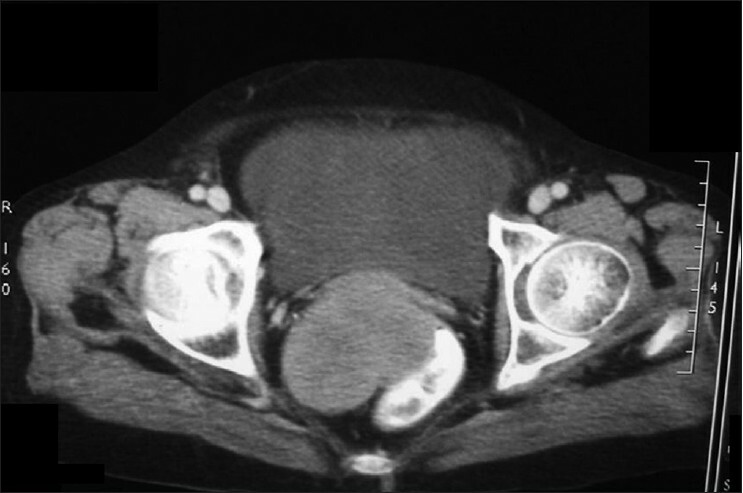 Further study with better follow-up is desired to characterize these uncommon tumors. Introduction: CD10 is a zinc-dependent peptidase (metalloproteinase). Stromal CD10 expression in breast cancer correlates with poor prognosis, oestrogen receptor negativity and higher grade. CD10 may be a potential target of new cancer therapies as it is involved in cleavage of doxorubicin. Aim: To evaluate the effect of neo-adjuvant anthracycline-based chemotherapy on status of stromal CD10 antigens in breast cancer. Materials and Methods: Patients with invasive breast cancer scheduled for anthracycline-based neo-adjuvant chemotherapy were included in the study. Tumor stromal CD10 expression was estimated before and after 3 cycles of chemotherapy, and change in its status was correlated with clinical response to chemotherapy. Results: 16 out of the 29 patients had strong CD10 expression; in these 16 patients, 14 (87.5%) were hormone receptor negative, and 14 (87.5%) had HER-2/neu overexpression. Stromal CD10 expression remained same in 13 out of 29 cases (44.83%) after chemotherapy. There was a change in CD10 expression in the remaining 16 cases (55.17%); in 13 cases (44.83%) it decreased from its pre-chemotherapy status, while its expression increased in 3 cases (10.34%). In cases of complete and partial clinical response, there was no increase in CD10 expression. Where CD10 expression had increased after chemotherapy, there was either a minor response or no response to chemotherapy. In 13 cases where CD10 expression had decreased, 12 cases had a clinical response to chemotherapy. Conclusions: Strong CD10 expression correlates with hormone receptor negativity and HER-2/neu overexpression. Stromal CD10 expression in breast cancer is not static and changes with neo-adjuvant anthracycline-based chemotherapy. A stable or decrease in CD10 expression correlates with complete or partial clinical response, while an increase in CD10 expression appears to correlate with poor clinical response. A larger series is required to determine the clinical significance of these changes. As stromal CD10 expression and its change with chemotherapy may have a prognostic significance, they should be documented in breast cancer patients before and after chemotherapy. Background: Bone is the most common metastatic site for breast cancer. Aim: To determine the effectiveness of addition of chemotherapy to hormonal therapy in postmenopausal hormone receptor-positive breast cancer patients with isolated bone metastases. Materials and Methods: Between June 2001 and January 2007, 101 patients were classified into two groups according to initial treatment modalities; patients who received hormonotherapy only (group I) and chemotherapy followed by hormonotherapy (group II). The effect of treatment choice on clinical course, time to progression, and overall survival were evaluated. Results: There were 70 patients in group I and 31 patients in group II. Bone metastases in 27 patients (26.7%) were synchronous and the remainder were metachronous. The median follow-up time was 41 months. 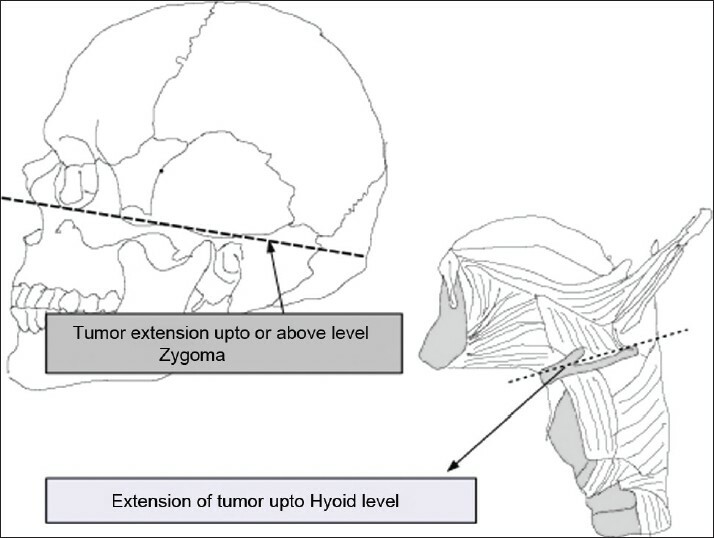 The two groups showed similar results when patients' tumor characteristics were compared. However, 81% of synchronous cases had upfront chemotherapy following hormonotherapy, whereas this ratio was only 12% in the metachronous group. 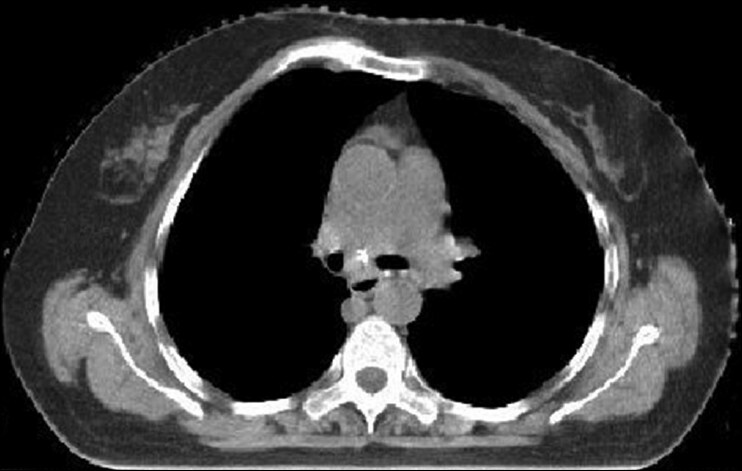 All patients received systemic antiresorptive bisphosphonates whereas only 24 patients required palliative radiotherapy at some time during the course of their disease. In groups I and II, the median time to progression was 12 and 16 months (P: 0.96) and median overall survival was 41 and 40 months (P: 0.79), respectively. 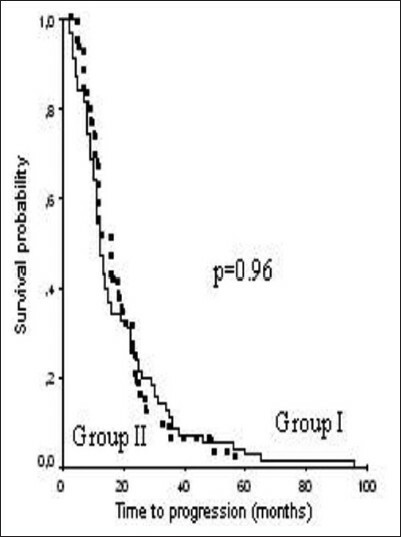 In HER-2-positive patients, a trend of prolongation of overall survival was observed in group II, but it was not statistically significant (P: 0.12). Conclusions: Anti-hormonal therapy still seems to be considered as the ideal treatment of choice for postmenapousal breast cancer patients with isolated bone metastases. Aims: To compare the clinical and pathologic assessment of response to neoadjuvant chemotherapy and describe the various histopathologic changes observed. Materials and Methods: We studied a group of 40 patients with locally advanced breast cancer who had their initial workup in the form of clinico-imaging assessment of the size and pretreatment biopsy from the lesion. All the patients received two to six cycles of neoadjuvant chemotherapy, either cyclophosphamide 50 to 60 mg/m 2 IV, doxorubicin 40 to 50 mg/m 2 IV and 5-fluorouracil 500 to 800 mg/m 2 IV (CAF) or cyclophosphamide, epirubicin, and 5-fluorouracil (CEF). 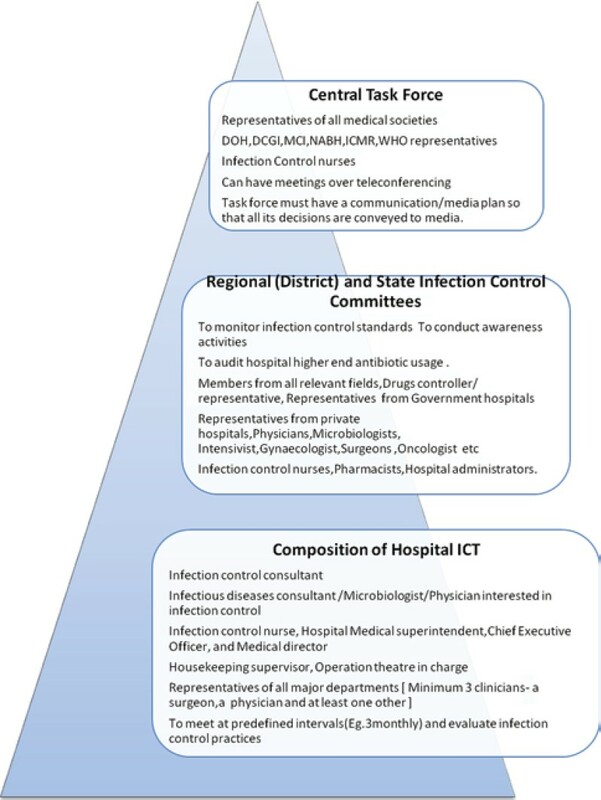 Clinical and pathologic assessment of response to chemotherapy was done based on the UICC guidelines. Result: Complete clinical response (cCR) was seen in 10% cases (4/40), thirty percent patients had (12/40) partial response and 60% (24/40) had stable disease after neoadjuvant chemotherapy. Pathologic complete response (pCR) with no evidence of viable tumor was observed in 20% patients (8/40). Fifteen patients (37.5%) showed partial response and 42.5% patients (17/40) had a stable disease. No patient progressed during the course of chemotherapy. Changes in the tumor type were observed following chemotherapy, most common being the mucinous change. 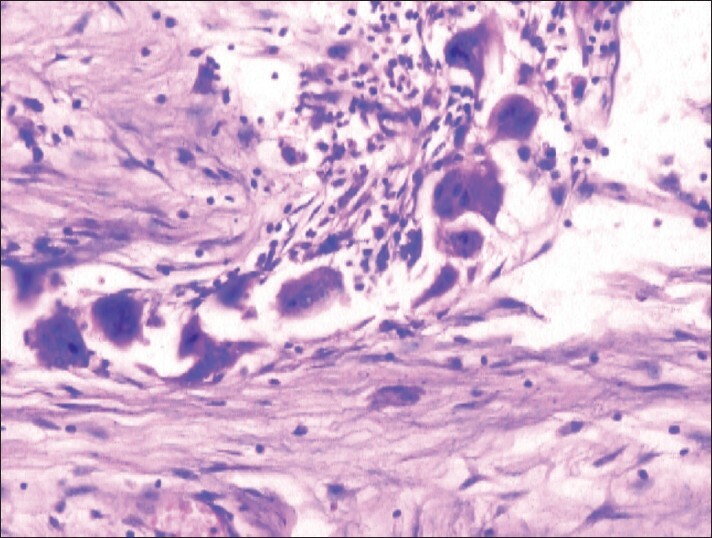 Histologic changes like dyscohesion, shrinkage of tumor cells, elastosis, collagenization, necrosis, lymphocytic reaction, giant cell response are some of the common observations seen following treatment with neoadjuvant chemotherapy. Conclusion: Pathologic assessment of response to neoadjuvant chemotherapy is a better predictor than the clinical response. The chemotherapy drugs can be modified based on the response observed after 1-2 cycles of neoadjuvant, the response being based on both tumor and patient's responsiveness. Objective: To identify and quantify various demographic, reproductive, socio-economic and dietary risk factors among women with breast cancer. Study Design: Case control study. Study Period: February 2004 to May 2005. Study Setting: Departments of Surgery, Medicine and Radiotherapy of Jawaharlal Institute of Postgraduate Medical Sciences and Research (JIPMER), Pondicherry. 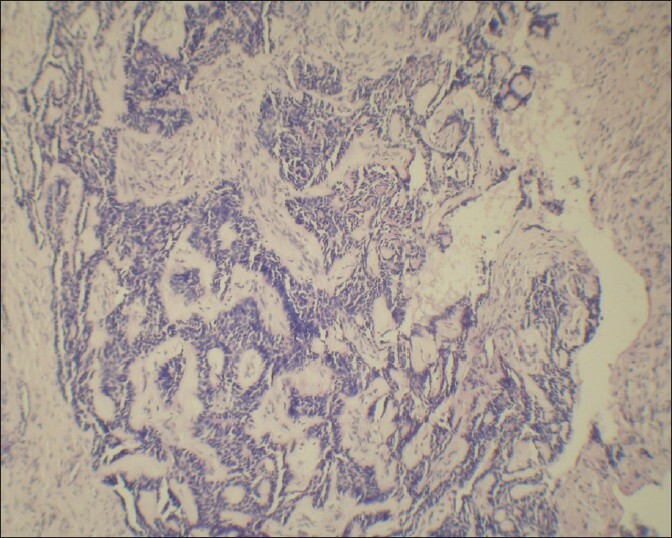 Materials and Methods: Cases were women with pathologically confirmed breast cancer. Controls were age-matched women from medicine and surgery wards without any current breast problem or previous breast cancer. A total of 152 cases and 152 controls were enrolled. They were interviewed for parity, breast feeding, past history of benign breast lesion, family history and dietary history with a pre-tested interview schedule after obtaining informed written consent. Results: The significant risk factors were (odds ratios with 95% CI) previous history of biopsy for benign breast lesion 10.4 (1.3-86.3), nulliparity 2.4 (1.14-5.08), consumption of fats more than 30 g/day 2.4 (1.14-5.45) and consumption of oils containing more of saturated fat 2.0 (1.03-4.52). Conclusions: Nulliparity, past history of benign breast lesion, high fat diet and consumption of oils with more saturated fats were the risk factors.